Whey is a natural product, derived from milk as part of the cheese making process. It’s a complete protein meaning it contains all of the essential amino acids required to support muscle maintenance in an active lifestyle. Whey Protein is particularly high in the three branched chain amino acids (Leucine, Isoleucine and Valine) which makes up around 1/3 of skeletal muscle, it is also a fast digesting protein making it an ideal protein source following any strenuous physical activity. Whey also naturally contains immunoglobulins and lactoferrin. Whey is versatile and can be taken with water, milk or even blended with fruit or non fat yoghurt. Protein supports the maintenance and growth of lean muscle mass. For adults, blend 2 x 60ml scoops to 250ml of water, juice, milk or yoghurt. For best results, use an electric blender and once mixed the product should be consumed within 20 minutes. You can drink MET-Rx® Supreme Whey any time during the day to add extra high quality protein to your daily kilocalorie intake. Be sure to figure the extra kilocalories provided by milk, juice, yoghurt, or whatever you may add to your MET-Rx® Supreme Whey. Ensure adequate hydration during and after training - Minimum of six to eight glasses of water daily. Protein Blend (Whey (Milk) Protein Concentrate (WPC80), Hydrolysed Whey (Milk) Protein, Whey (Milk) Protein Isolate, Soya Protein), Dutch Processed Cocoa Powder (Sulphites), Emulsifier (Soya Lecithin), Maltodextrin, Sweetener (Sucralose), Starch, Vanilla Flavouring (Sulphites), Lactoperoxidase (Milk). intended for use by persons under the age of 18. Keep out of reach of children. Do not use if seal under cap is broken or missing. 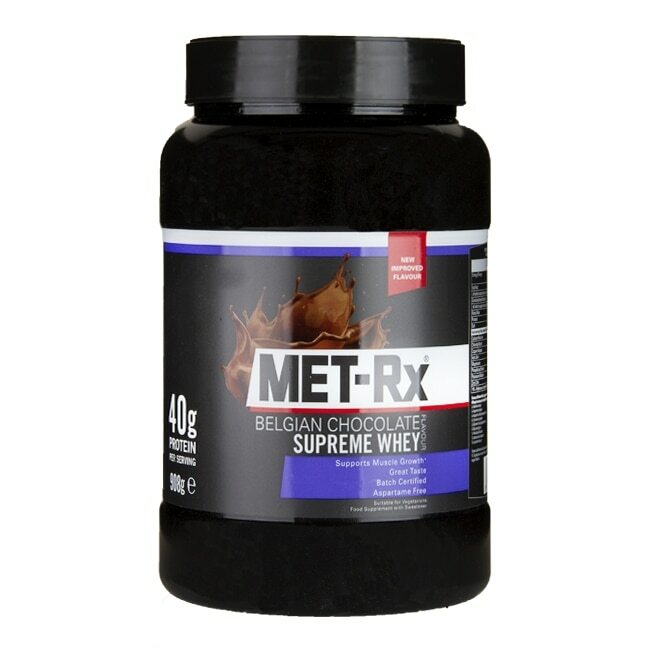 Met-Rx Supreme Whey Chocolate is rated 4.1 out of 5 by 7. Rated 5 out of 5 by ANNIEPUMP from Great price great service I was able to get my favourite met rx protein powder at a fantastic price. Easy to order and arrived in 2 deliveries really quickly. Now enjoying my purchase thanks Holland and Barrett! Rated 3 out of 5 by Ladyjackson8 from Reasonable Whey Protein Shake Not a bad flavour. Need to ensure it's shaken properly to avoid any lumps occuring. Helped keep me going until lunchtime.